His tagged recombinant Human PON1 protein purified E.coli. HeLa, HepG2 cell lysates, mouse liver tissue lysate. This product was changed from ascites to tissue culture supernatant on 18th September 2017. Lot numbers higher than GR202765 will be from tissue culture supernatant. Please note that the dilutions may need to be adjusted accordingly. Our Abpromise guarantee covers the use of ab24261 in the following tested applications. WB Use a concentration of 4 mg/ml. Predicted molecular weight: 40 kDa. Lane 1 : HeLa cell lysates. Lane 2 : HepG2 cell lysates. ab24261 (1µg/ml) staining PON1 in human liver using an automated system (DAKO Autostainer Plus). Using this protocol there is strong cytoplasmic staining of hepatocytes. Overlay histogram showing HepG2 cells stained with ab24261 (red line). The cells were fixed with 4% paraformaldehyde (10 min) and then permeabilized with 0.1% PBS-Tween for 20 min. The cells were then incubated in 1x PBS / 10% normal goat serum / 0.3M glycine to block non-specific protein-protein interactions followed by the antibody (ab24261, 1µg/1x106 cells) for 30 min at 22°C. The secondary antibody used was DyLight® 488 goat anti-mouse IgG (H+L) (ab96879) at 1/500 dilution for 30 min at 22°C. Isotype control antibody (black line) was mouse IgG1 [ICIGG1] (ab91353, 2µg/1x106 cells) used under the same conditions. Acquisition of >5,000 events was performed. This antibody gave a positive signal in HepG2 cells fixed with 100% methanol (5 min)/permeabilized in 0.1% PBS-Tween used under the same conditions. ICC/IF image of ab24261 stained HeLa cells. The cells were 4% PFA fixed (10 min) and then incubated in 1%BSA / 10% normal goat serum / 0.3M glycine in 0.1% PBS-Tween for 1h to permeabilise the cells and block non-specific protein-protein interactions. The cells were then incubated with the antibody (ab24261, 1µg/ml) overnight at +4°C. The secondary antibody (green) was Alexa Fluor® 488 goat anti-mouse IgG (H+L) used at a 1/1000 dilution for 1h. Alexa Fluor® 594 WGA was used to label plasma membranes (red) at a 1/200 dilution for 1h. DAPI was used to stain the cell nuclei (blue) at a concentration of 1.43µM. Publishing research using ab24261? Please let us know so that we can cite the reference in this datasheet. I can confirm that antibody ab24261 can be used in ELISA (Indirect) with human cell lysates/ proteins. What is the concentration of HEPES in the buffer? Thank you for your phone call yesterday, and I apologize that we did not already have this information. I have heard back from the lab, and the buffer of ab24261 contains 10 mM HEPES. I hope this information is helpful, but please let me know if you have any further questions. I'm sorry to hear you are experiencing poor results with ab24261 in western blotting. Your protocol seems good in general and I have only a few suggestions which I help with resolve the problem: -As you are using a good positive control of HeLa cell lysate the problem does not seem to be low expression levels in this sample, however it would be worth trying a different lysis buffer as currently the buffer you use does not seem to be suitable for optimal extraction of the protein. I would therefore recommend using 20 mM Tris-HCl, pH 7.5, 1 mM EGTA and adding protease inhibitors to the buffer. Following lysis and centrifugation I would recommend to add reducing loading buffer to the supernatant and boiling for 5 min at 100C. -I am not familiar with the use of boric acid and EDTA in transfer buffers. We typically use a Tris transfer buffer made with 20% methanol and I would recommend to try this type of buffer. -it is good that you tried different blocking agents. Can I please make sure that you have tried blocking 1 hour only and incubating the antibody overnight in TBST only as sometimes the antibody binds the blocking agent rather than the membrane, if incubated too long together. -it would be worth checking that your transfer is working adequately by doing a Ponceau staining. I hope the suggestions above will help you. Please do not hesitate to contact me if those changes do not give you a better signal and I would be happy to offer you a replacement vial or refund if the antibody was purchased in the last 120 days. 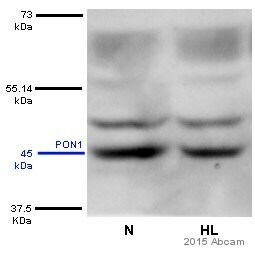 I already purchased PON1 antibody. I would like to know it is rasied against what peptide sequence. Thank you for your enquiry. This product has been raised against the full length recombinant form of the target. I hope that this information helps. It says that the antibody cross reacts with Mouse PON1. What is the epitope that the antibody recognizes, and how similar is the detection, ie: will 5?g of hPON1 give the same response with chemiluminescence as mPON1?